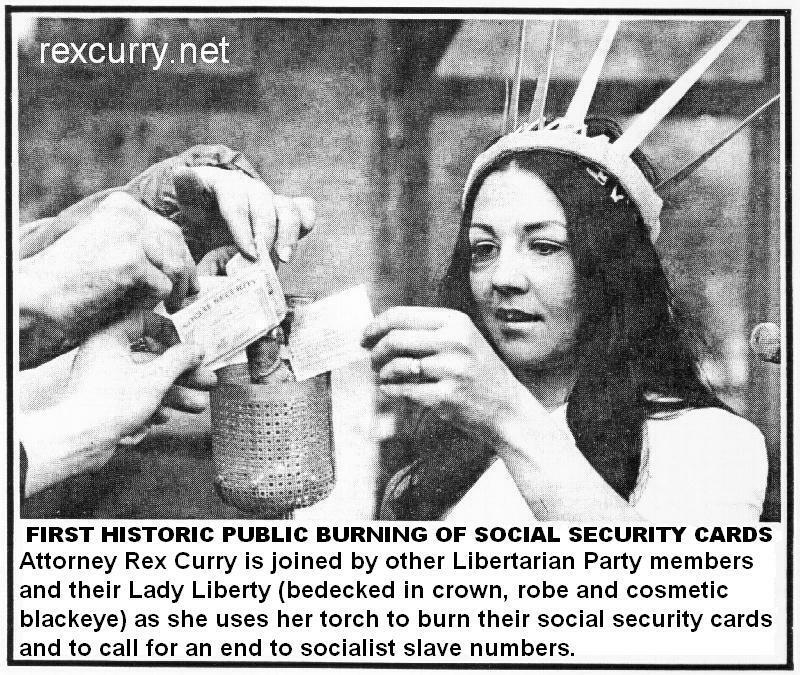 Join the nationwide burn parties to end the social security scam and to burn your socialist slave card in Lady Liberty's torch with Libertarians everywhere. 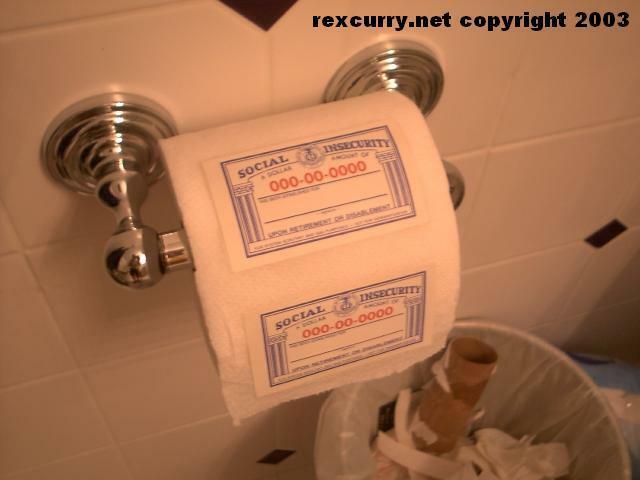 http://rexcurry.net/SSNall.html Host your own burn party with the resources linked below. & end your Nazi number. It is the "We Eat Our Young" card. The public obsesses about fine-tuning the theft program. The world is owed an apology for the horrid influence that government had (and still has in many ways) inside the U.S. and out in promoting socialized schools, military socialism within government schools, the creation of industrial armies, Nazi numbering, and daily robotic pledges of allegiance in military formation (that spread the infamous straight-arm salute). THE U.S. IS PRODUCING DRAFT CARDS - your social security card is your draft card. wake up. SOCIAL SECURITY IS UNCONSTITUTIONAL - from the worst President, the socialist F.D.R. & his Depression. PHOTO CONTESTS - send in old pics and make new ones to celebrate the best burn party photos. 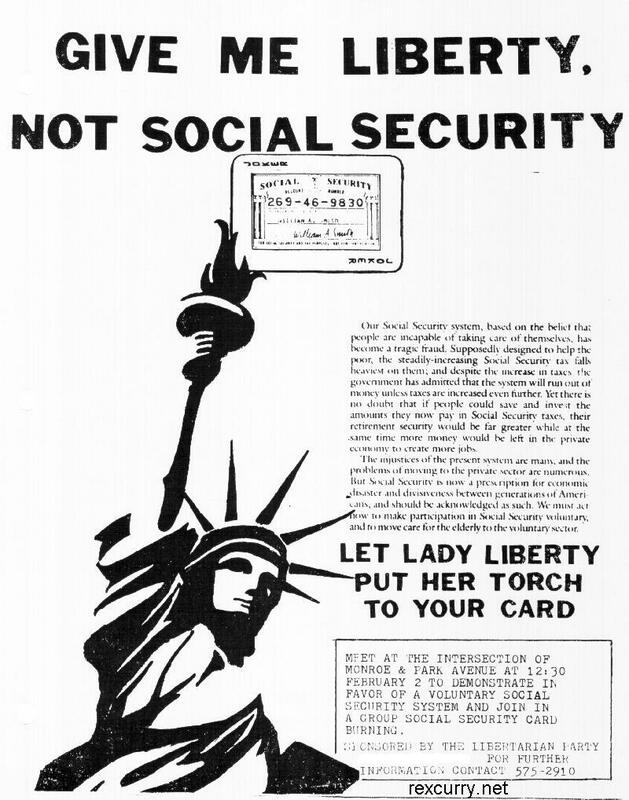 SAMPLE FLYER - this notice was used for a social security card burn party covered in many newspapers. SAMPLE SPEECH - this speech introduced a social security card burn party. YOUR SOCIALIST SLAVE # - (your social security #) came from the National Socialist German Workers' Party. 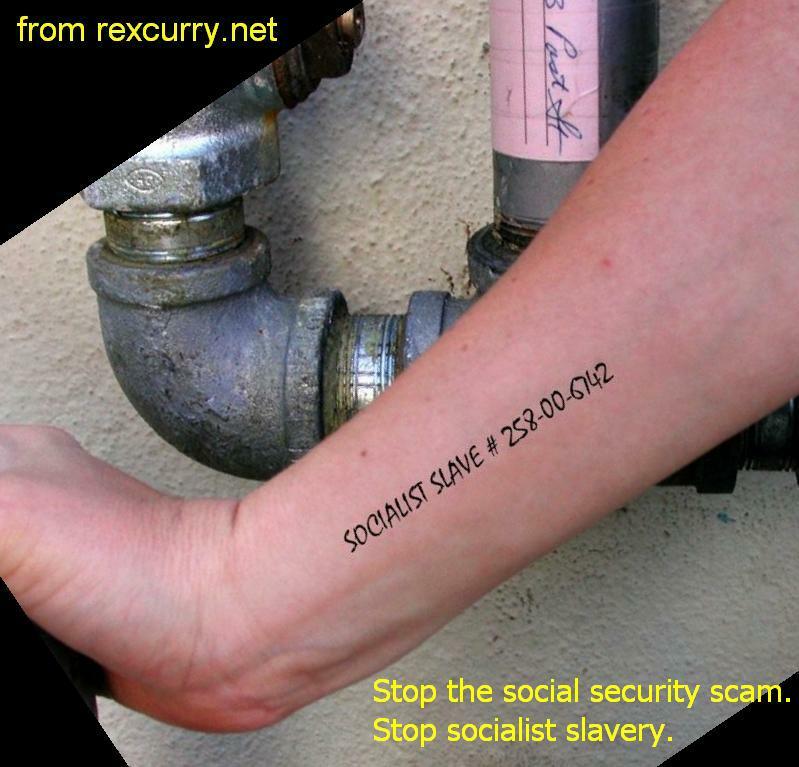 SOCIAL SECURITY # TATTOOS - some people are already getting them. When will you get yours? 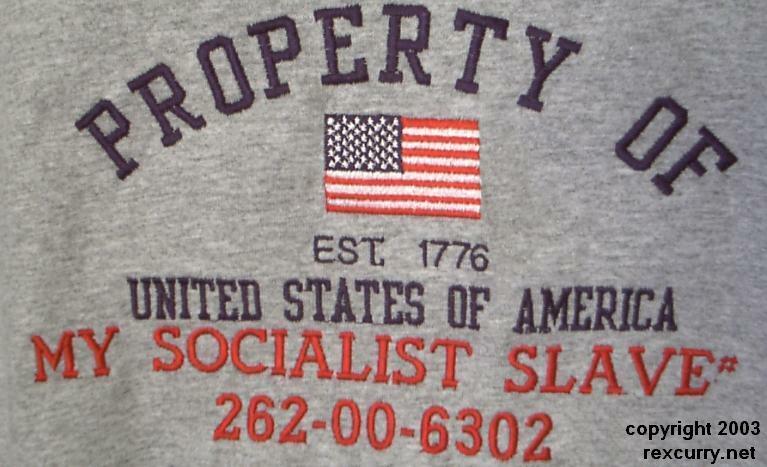 SOCIALIST SLAVE T-SHIRTS - wear your own popular shirt (front) (back) to tell everyone the truth. SOCIAL INSECURITY CARDS - if you already burned or lost your card, then burn these from Wisconsin. SOCIALIST SLAVE # BUMPER STICKERS - go with your car tag, VIN & eventual G.I. transponder. LICENSE PLATES - car tags to help track you by two of your many different socialist slave numbers. 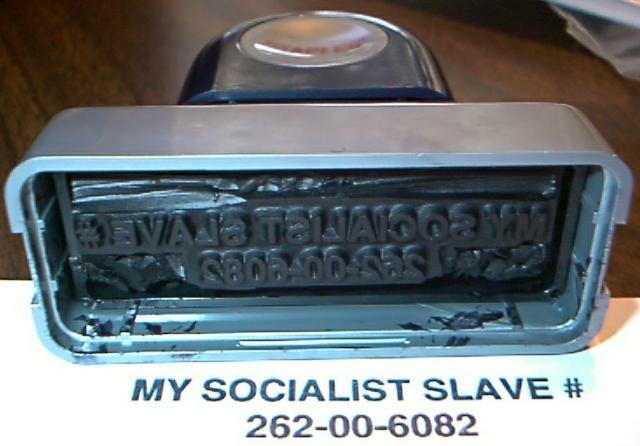 SOCIALIST SLAVE LAPEL TAGS in .PDF - "My socialist slave number is ___" as shirt labels. SOCIALIST SLAVE BUMPER STICKERS - ties it into the national socialist philosophy. HELLO! - My Socialist Slave number is..... -another convention-style sticker for publicity stunts. 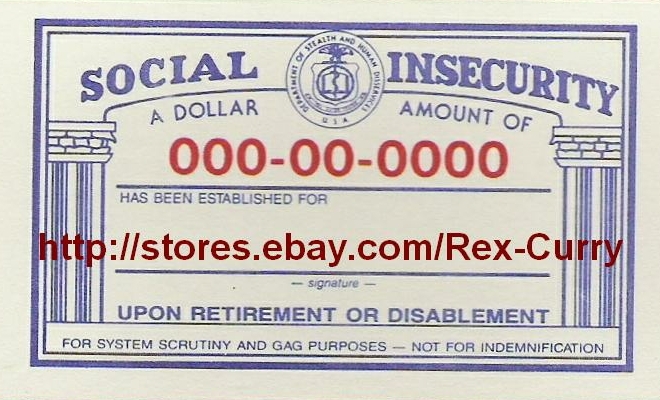 SOCIAL SECURITY UNIVERSAL BARCODES - for scanning you & to keep you in line. CUSTOM NECK TIES - "My socialist slave number is _______" in a classy design for professionals. THE SNTSS SUPERHERO - you can be the "Say No to Socialist Slavery" superhero and have fun too! AUGUST 14 - the day the socialist slave system was imposed nationwide in 1935. SEPTEMBER 1 (LABOR DAY) - Workers break the chains of the SS scam & their socialist slave numbers. GRANDPARENT'S DAY - Senior citizens help to stop the social security scam every September. DECEMBER 1 - the day the first socialist slave number was forced upon a free individual in 1936. DECEMBER - as an attorney, I explain how Social Security darkened the month of December. SAMPLE MEDIA LETTER - an example of a letter to the media for announcing burn parties. 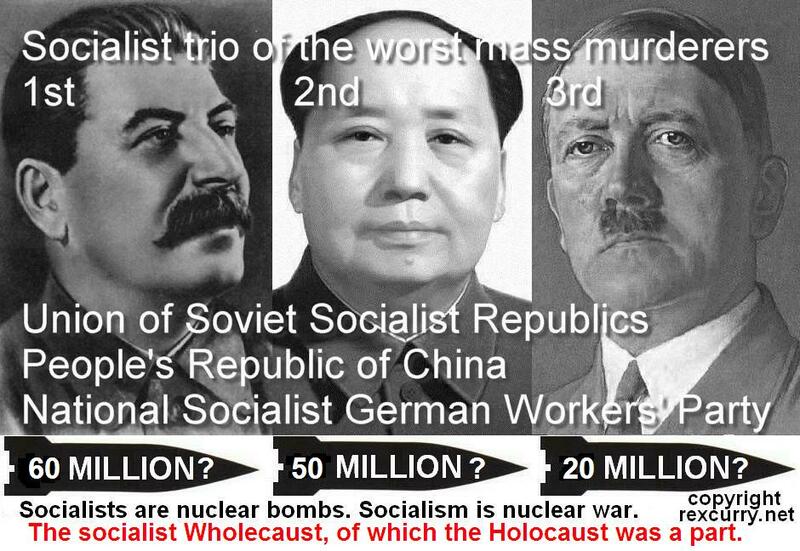 MILLION MAN MARCH - imagine a million socialist slave cards burning at once in Washington D.C.
SOCIAL SECURITY KILLS - the theft prevents people from buying health insurance and healthcare. "Under the [President's Social Security] proposal, workers could invest as much as 4 percent of their wages subject to Social Security taxation in a limited assortment of stock, bond and mixed-investment funds. But the government would keep and administer that money. Upon retirement, workers would then be given any money that exceeded inflation-adjusted gains over 3 percent." (Washington Post, Thursday) And if that isn't terrorizing enough, wait till it goes through the legislative compromise mill and the loaf is pinched out the other end.